Seriously, you have been actively told not to use it, by the UK and US governments. A security flaw in the browser means that hackers can now literally see into your soul via the medium of Internet Explorer. Okay, maybe not your soul, but not far off it. Versions 6 to 11 are under threat and until Microsoft finds a fix hackers could be able to gain full user permissions over remote computers, allowing them to install programs, and view and delete data. In 2011 a hoax survey which claimed that people who used Internet Explorer rather than other browsers like Chrome, Firefox and Safari had a lower IQ. 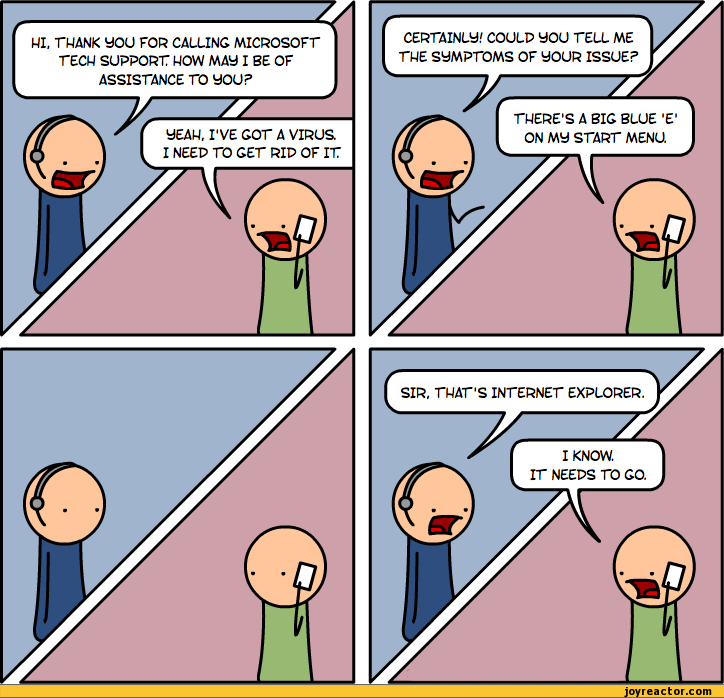 'Ditch it entirely' is the only acceptable answer RT @CathalMacCoille Worried about #internetexplorer warning and wondering what to do? The U.S. government is telling people to stop using Internet Explorer. Now everyone has told them. A new vulnerability is affecting Internet Explorer users. U.S. Homeland Security warns people not to use Microsoft Internet Explorer. Please pass that on to your grandparents ASAP. Email “7 excellent reasons why you shouldn't be using Internet Explorer ”. Feedback on “7 excellent reasons why you shouldn't be using Internet Explorer ”.